myFico.com - You've got to be kidding?Eliminate The Muda! « Do Credit Limit Reductions Affect FICO Scores? OK, I admit, I’ve lost control. I am now on a rampage to compile a complete dossier on my personal financial life. After the fun of www.annualcreditreport.com I just couldn’t help linking over to myFico.com last night. It has been so long since learning my FICO score and the mystery was killing me. The first surprise is that there is not just one FICO score. I had been under the impression that there was one and only one FICO and then several “FAKO” scores, one for each credit reporting agency. Knowing that most creditors use the real FICO score this is what I wanted. As it turns out Fair Issac does compile scores for TransUnion and Equifax. The difference is based on the data that each credit reporting agency has on file. In theory, if both agencies have the same data your scores should be the same. Experian ended their relationship early this year. As a result they produce and provide their own version of a credit score called the VantageScore. Since I had already ordered the TransUnion credit report, I figured I would only purchase the Experian FICO score. For $15.95 you can obtain one score along with the credit report from the selected credit reporting agency. After filling out the basic name address etc., the next page actually offered to link me up with “Lenders You Can Trust.” Of course there is no obligation but this just seemed a little ironic because fundamentally when you have debt, in general, this lowers your score. Amazingly, I ran into the same “for security purposes” wall as www.annualcreditreport.com, and needed to call into myFico.com this morning. After wasting time on hold for their phone system, I provided the exact same information I had entered on the site last night. The young lady asked how much my mortgage payment was. I gave her a range since we alway pay extra and it is on automatic withdrawal, I just couldn’t remember. It seems the rough estimate was enough because with that she made the report available on-line. A 785 is nothing to sneeze at, that’s nearly 60 points better than 3 years ago. But what was more interesting was the wealth of information that is provided along with the score. Not only do you get to review your credit report but myFico.com provides some interesting measures and tools to help you figure out how to improve your score further. To move the needle on Length of Credit History appears to simply take more time. My oldest account was opened 14 years ago while the “FICO High Achievers” opened their oldest accounts 19 years ago on average. This makes me wonder if I should get a credit card for my kids and then control it with an iron fist to give them a leg up on their future. My other area of opportunity is Amount of Debt. We have one mortgage and 2 credit cards, one personal and one “business”. The personal card never has more than a few hundreds dollars charged on it and is always paid off. The “business” card, used mostly for travel expenses, can have as much as $7,000 on it at any one time. It too is paid off every month in full. At the time of this credit analysis I had a balance of $5386. This is where it got interesting. 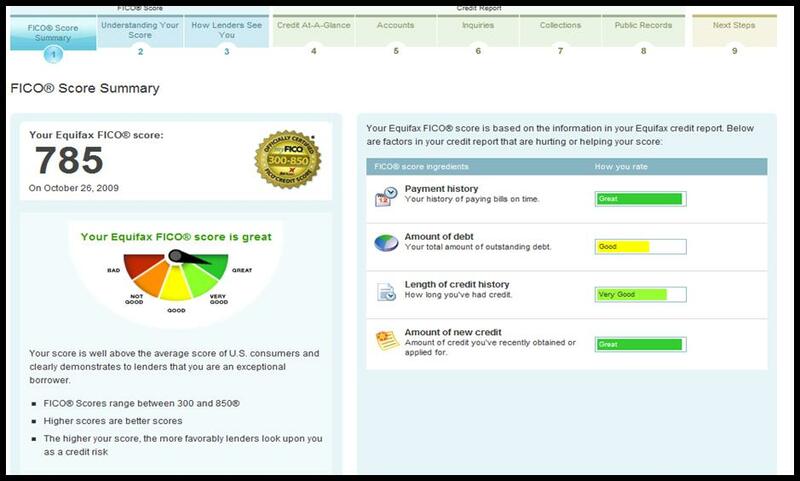 myFico.com has a FICO score simulator that you can use to see how credit decisions might affect your score. I first ran the simulation assuming that I paid off $2000 of this $5286 (even though we pay it in full each month!). The result was a predicted score in the range of 785-805. So then I figured it must go higher if I pay the debt in full. Wrong! The result was a predicted score of 785-805. Well, if paying it all wasn’t enough, what could I do to increase the score? I figured that maybe they want to see me with more credit. I ran a simulation with a new revolving credit card that had a credit limit of $5000. The result was a score of 775-795. At this point I noted at the top of the page an option to select the “Best Action.” When selecting this choice myFico suggested paying off 90%-100% of my debt would result in a credit score of 795-835. After the simulation above paying off the entire $5286 and receiving a predicted score of 785-805 this just didn’t make sense. For the heck of it, I went back and ran a simulation suggesting that I pay off only $5000 of the $5286 and this resulting in a predicted score of 785-825. This is why I always end up doubting statistics, analysis and reports by the mathematicians, statisticians and government. Granted, the last 2 simulations are in the same neighborhood but still. It is hard to feel confident when the same conditions have different results. With a score in the range of 760-850 we should be able to get the best interest rates, if we ever borrow again. With age of credit being a critical factor and having only the two cards it may have a profound impact on our score if we ever want to change credit card companies. I’ll have to make those decisions carefully! In retrospect, maybe we should have established a relationship with another card many years ago. I owe my wife a big hug; it’s because of her that we always pay our bills ahead of schedule! Have you checked your FICO score and were there any surprises? Based on your experience do you have any further suggestions on how to get the highest score possible? If so, please take a moment to leave a comment below!